I’ve decided that these new seed creations would each have a gentle convex shape that would emphasis it’s design and structure. I toyed with the idea of using wire mesh underneath to create the form but I felt I wanted to keep things soft. So using wool batt, a form was made. Then came the (for me) tough problem of how to insure this form would push out the front and not the back! I mickey moused a solution. I’m sure there’s some professional way to do this (if you know please clue me in!). I’m in the process of dyeing a piece of background charmeuse silk for each seed. A color is auditioning to the left. I’m planning on heavily stitching each background piece and then hand sewing the seed on. And I have sketches for the third seed shape. 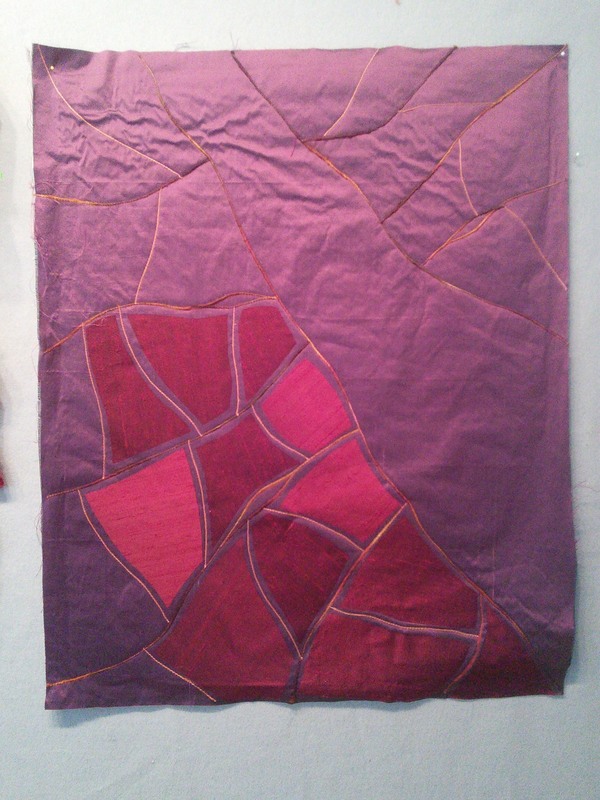 I’m on to working on the second large “dreaming seed” and really enjoying the process. I’m hoping to have at least three ready for my upcoming solo show at Mitchell-Giddings Fine Arts (in August-stay tuned for details!). Each seed has a unique interior dream going on but they will all share a similar color pallette. I’ve never before attempted to create individual pieces that also have a close connection with each other and that will (hopefully) together have a larger visual impact. Lots of decisions looming, though, about how to mount and hang these. So I’m completing each seed first. Will I mount each one on stitched fabric or on rigid frames or plexiglass or perhaps bowed out on mesh armatures or…lots of ideas! The brilliant folks in my Art Crit group and in my Fiber Crit group (yes, I’m blessed with two!) all have showered me with a dazzling amount of wild ideas! It’s all percolating and I find myself trying out ideas in my head at odd times during my days-my usual laboriously slow decision process. Well new to me anyway. Apparently it has been used for hundreds of years in Japan and elsewhere in Asia. 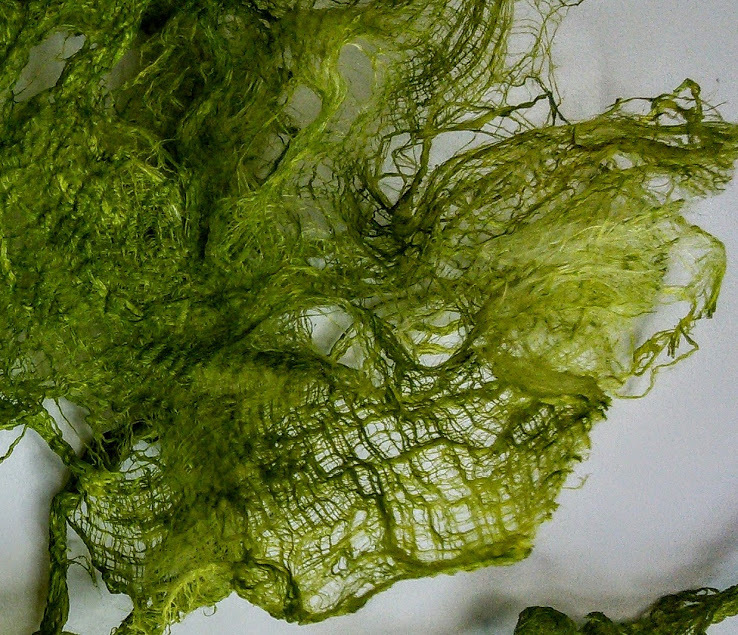 It’s also referred to as kozo and is used extensively in papermaking. I got some bleached and then dyed it with Setacolor. 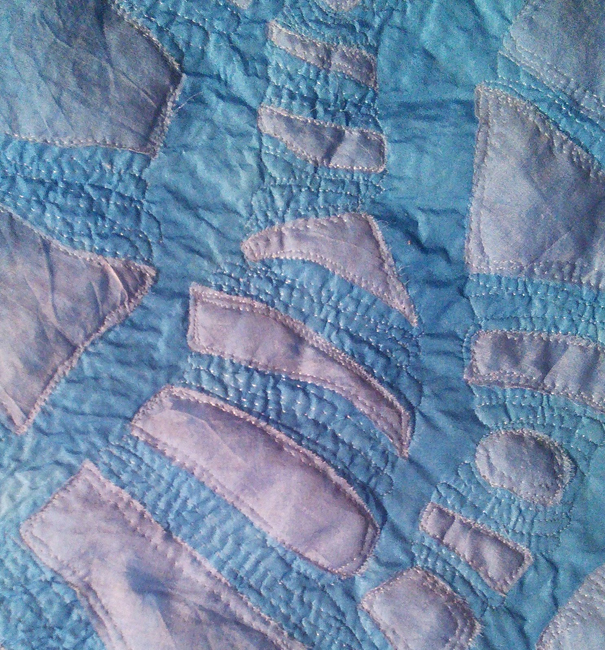 I’m a sucker for the texture which is irregularly grid-like but can be teased into curvier lines that form around serendipitous holes. Very fun to play with. It’s quite stiff and when wet and shaped will dry to that shape. Folks, like this woman, make delicate bowls with it. 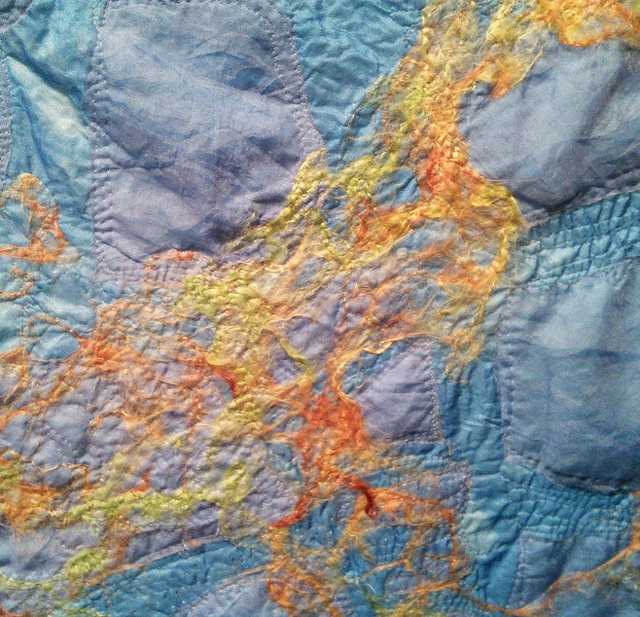 Me, I will dye it, pull the fibers into the pattern I want and stitch it down. That’s the plan anyway. I think it has great potential to add interesting organic surface texture. Have any of you used it? During this past summer, due to other obligations, my artmaking was fairly fallow. Periods of time like that leave me uneasy and both eager to get back to it and anxious that it won’t come easily. Though I wasn’t dyeing and stitching much, my mind was playing with an unformed, vague idea that I wanted to do something about Breath. This connects to my (mostly) daily meditation practice and the role breath plays. It also fired up my curiousity to understand more about respiration both in us and in plants and how the miraculously efficient and rapid exchange of oxygen and carbon dioxide takes place. And this (of course, to me!) lead to thoughts about the interconnectedness of our world. I get excited about making art when the seeds of an idea are connected on multiple levels like this! I felt a series coming on…and about a month ago, I got to work! There are several new-to-me materials I knew I wanted to include one being silk organza (lovely but tricky) as well as attempting to sew bombyx silk directly onto fabric and felt. Many mistakes were made! A lot to learn! Here are a few glimpses-close up detail shots-of the workpiece in process on my design wall right now. Hmmm…hard to believe these are all coexisting in the same piece! Hopefully I’ll finish it and post a photo soon. If you’re late to this party, here’s Part 1 and Part 2. 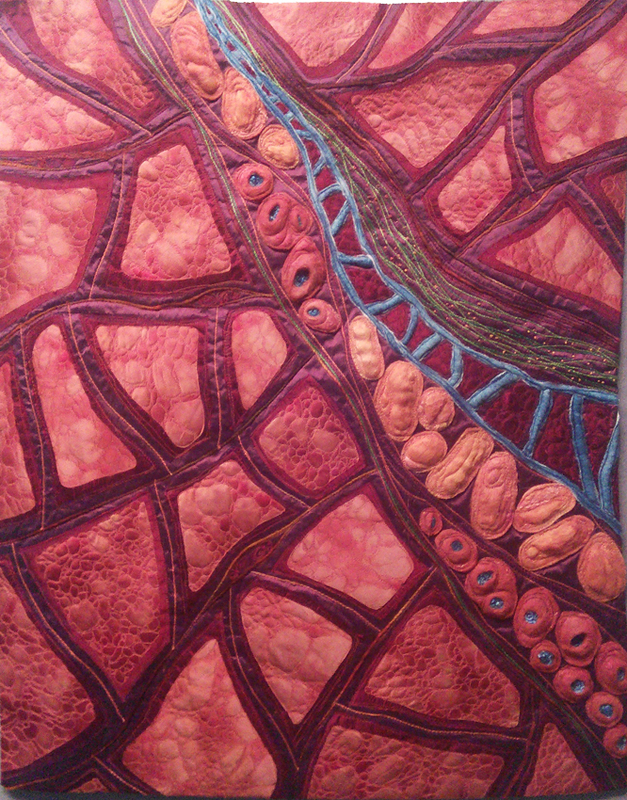 Now that the lower left and upper right cellular sections were mostly complete, I needed make some choices about how to use the large space between them where I wanted to somehow show a flow happening. This took time-with lots of ideas tried and rejected. This is the stage in the process where a lot of self doubt creeps in. 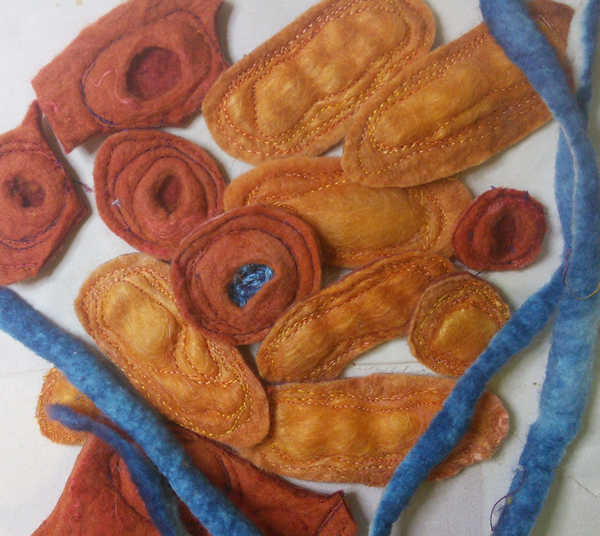 I had a pile of felted “elements” which I had separately stitched to add shape and sculptural lines . I knew I wanted to incorporate them but there were endless possibilities as to how. I considered color, balance and line as well as the abstract “story” in my head of what moment of change/transformation was happening. After weeks (really! ), I found a direction, I was happy with. Lines were couched to carve the space into flowing sections. I had known all along that including the blue felt was critical, but wasn’t happy till I stumbled on the “ladder” possibility. This now defined the basic structure of the space so I was more sure of myself and confident I was moving in the right direction. 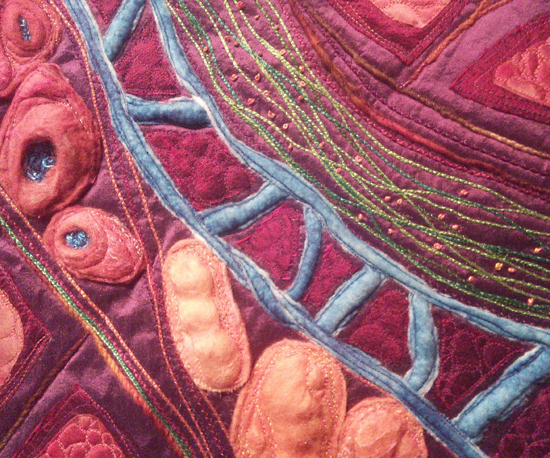 It was then much clearer to see how to show movement and flow with stitching,the felt pieces and some lovingly placed french knots. Next time: the whole enchilada done. If you missed it, here’s the previous post about this process. Once the underlying structure was complete, things got much more interesting for me. 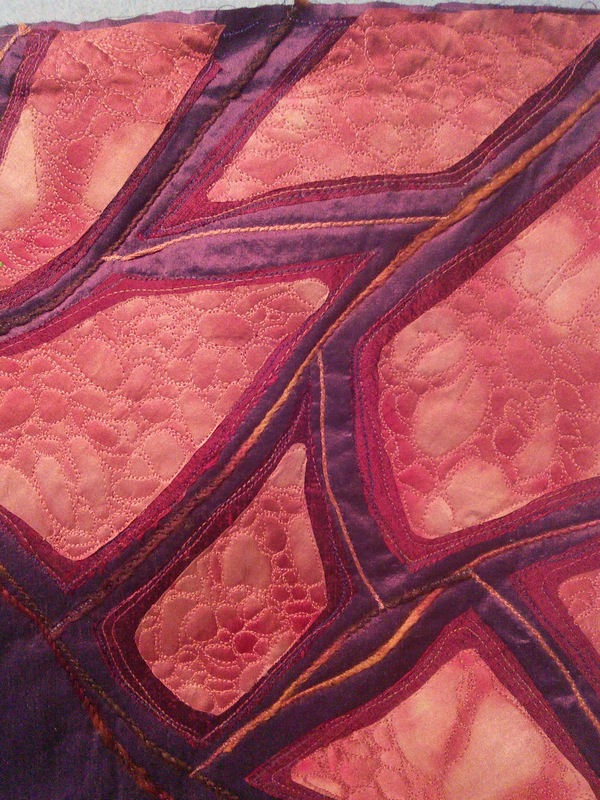 I selected a piece of silk I had dyed over a year ago that had a beautifully complex and intricate texture. This was cut and fused to each cellular section. …and I happily free motion stitched each one. 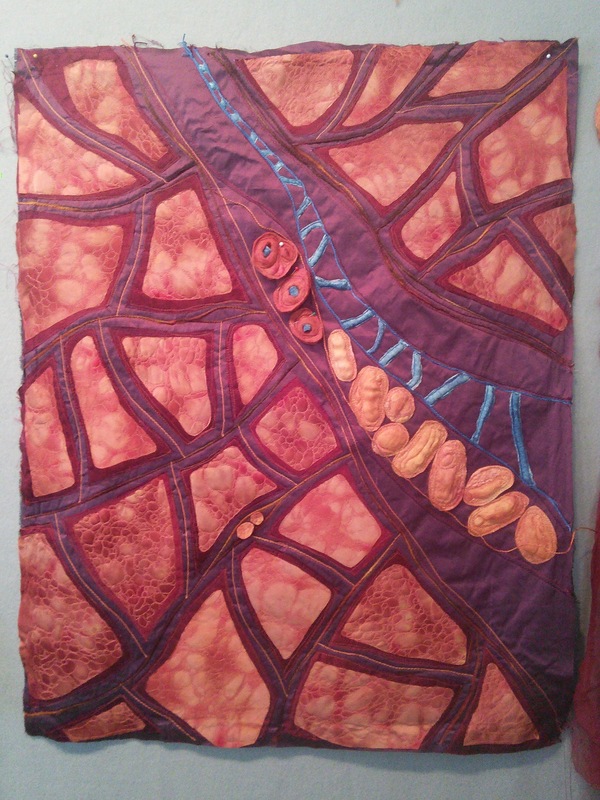 I love this part-podcasts and stitching! I’m often asked questions about my process so whenever I start a new piece, I try to make a commitment to document it along the way…and usually fail. 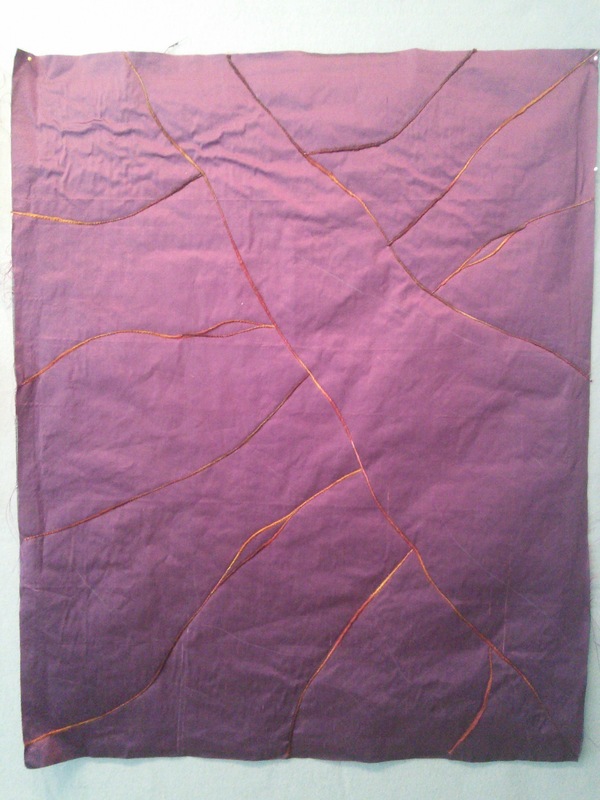 BUT the piece I just finished, Roots of Rhythm X was happily an exception. So, if you’re interested, here are a series of posts looking at the steps to its creation. This piece was under construction for the better part of two months. 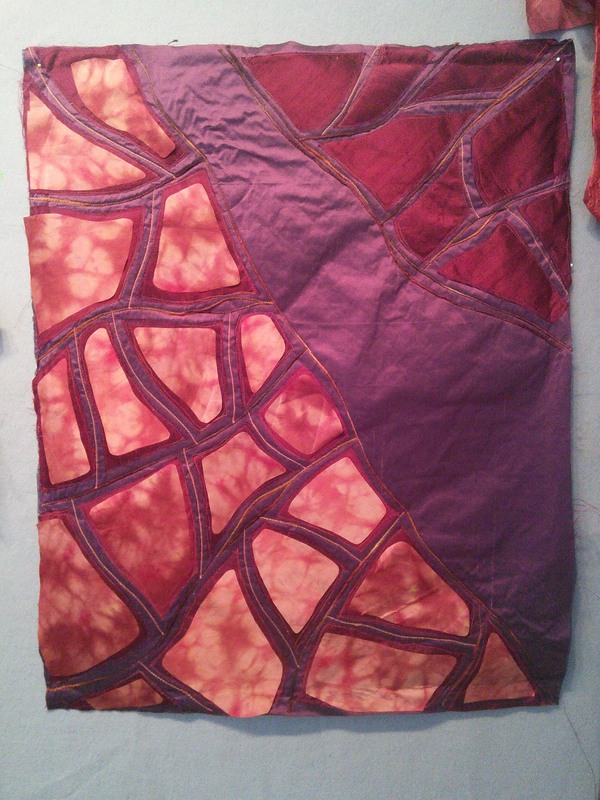 After sketching out some rough ideas and making some critical color decisions (documenting that step would involve many pictures of me pawing through piles of dyed silk and looking discouraged and lost), I chose the violet background silk, fused it onto a piece of Warm and Natural batting cut a few inches smaller. 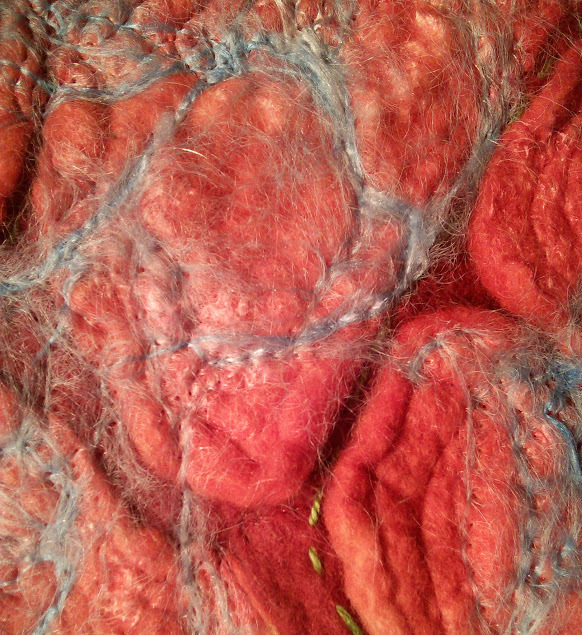 I then couched varigated yarn to build the cellular grid. When the grid was done, inner shapes were added. 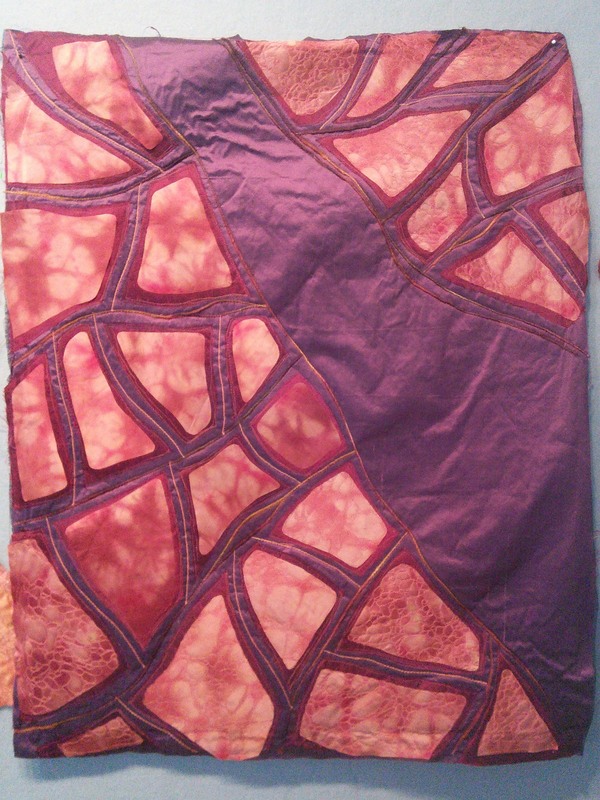 This red/rust silk is all one color. The variation comes from light catching the nap of the charmeuse at different angles. …till all spaces were filled. 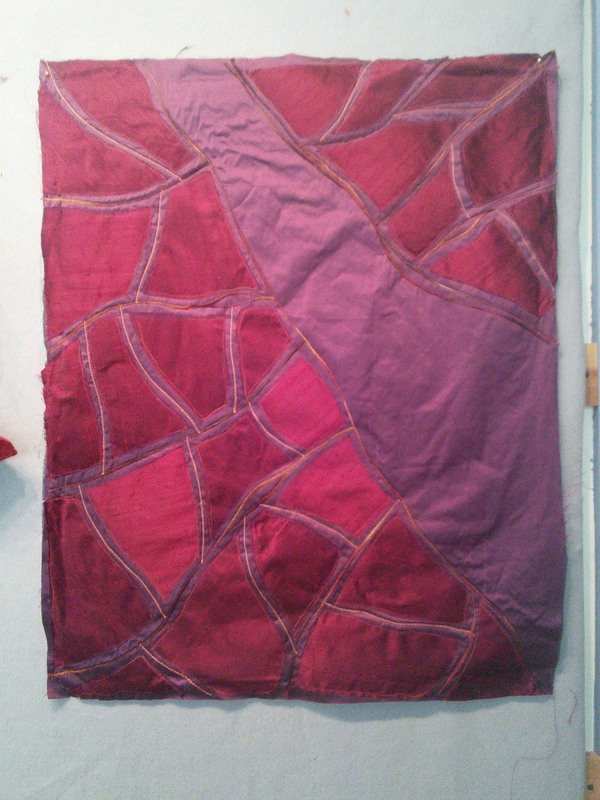 I then stitched around each red/rust shape. Please let me know if you have more specific questions about these steps.